» A TV Review by Michael Shonk: PHILO VANCE, DETECTIVE. A TV Review by Michael Shonk: PHILO VANCE, DETECTIVE. PHILO VANCE, DETECTIVE. Official Films, 18 minutes. 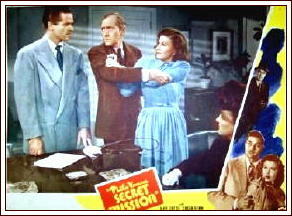 (Originally Philo Vance’s Secret Mission, PRC, 1947; 58 minutes). Cast: Alan Curtis, Sheila Ryan, Tala Birell, Frank Jenkins, James Bell, and Frank Fenton. Philo Vance, Detective did not include any onscreen credits except for the actors listed above. (The actor listed as Frank Jenks in all the databases is credited on screen as Frank Jenkins.) According to the TCM (Turner Classic Movies) database and imdb.com, the original film was written by Lawrence Edmund Taylor and directed by Reginald LeBorg. S. S. Van Dine received no screen credit. In 1947 PRC (Producers Releasing Corporation) made three Philo Vance theatrical films: Philo Vance’s Secret Mission, Philo Vance’s Gamble, and Philo Vance Returns. Both Secret Mission and Gamble featured Alan Curtis as Philo with his assistant Ernie Clark played by Frank Jenkins. In Returns Philo was played by William Wright (without Jenkins). 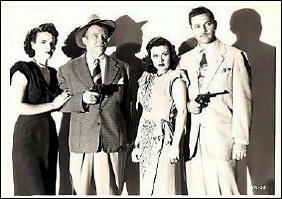 The PRC version of Philo Vance resembled the generic detective hero of the average 1940s Poverty Row studio film series more than S. S. Van Dine’s creation. By the 1950s television had become the gluttonous beast with an insatiable appetite for content that it remains today. When the networks were unable to fill the needs of the TV stations, the stations turned to syndicated producers such as Ziv, CBS TV-Films and Official Films. Distributors such as MPTV (Motion Pictured for Television) acquired the rights to B-movies, cartoons and short films such as Philo Vance’s Secret Mission and sold them to the hungry hungry hippos aka the local TV stations. One of the major problems facing MPTV and others was local stations taking a dull ax and editing programs to suit the local station needs. This could be the cause for a 58-minute theatrical film to exist in a renamed TV version suitable for a half hour time slot. More likely, Official Films, one of the top syndication companies at the time, did the editing and sold it in a package of half-hour mysteries. Fortunately, the TCM database has a complete synopsis full of spoilers and credits for the 58-minute film short. Jamison (Paul Maxey), co-publisher of pulp magazines, has invited writer Philo Vance to his office to discuss the possibility of Vance writing a mystery based on Jamison’s former partner’s murder seven years ago. With his assistant Ernie Clark and a woman who is not introduced, says nothing and no one says anything to her during the long scene (she is Vance’s secretary Mona), Vance meets the suspects. Mona (Sheila Ryan) will be in nearly every scene of Philo Vance, Detective, while most of the rest in this scene will end up victims of the missing forty minutes and not be seen again. Jamison’s other partner is upset over the idea of leaving pulps to publish “books.” The company’s two main writers also hate the idea of mystery books (there are too many of them now). When Jamison announces he had solved the murder of the dead partner, office secretary and victim’s wife (Tala Birell) faints. Jamison invites Vance to his house that night to discuss the case. Vance and Mona arrive to meet Jamison. They hear gunshots and a cry for help. The two break into Jamison’s home to find blood on the floor but no body (just like the earlier murder). They call and wait for the sheriff. “I think I am going to faint,” says Mona, half seriously. “Why don’t you wait until the police come and I’ll catch you in my arms,” suggests Philo, who is busy on the phone. Vance and Mona leave but a motorcycle cop chases them down. The murdered man’s body is in Vance’s car trunk. Next we see a cop using the police radio informing all police cars to look out for an armed and dangerous killer, and the cop is nice enough to add Philo “and girl companion” have been released. Now the editing becomes noticeable. We miss all the scenes with the suspects, clues to motive, where the murder weapon came from, and information about the first murder. One entire character, Joe the cover photographer, ends up on the editing floor. Instead we jump to Vance and Mona driving to the first victim widow’s home. They are followed and shot at. Vance fights with the bad guy who runs away unseen in the dark. Vance rushes to the widow afraid she would be next. Instead he finds her packing for a cruise where she plans to marry her finance. More scenes vanish including (according to the TCM synopsis) the denouncement scene where Vance names his girl friend Mona as the killer (that I would need to see to believe). But it was all a ruse to trap the killer. At the cruise ship the killer is revealed, Vance suggests he and Mona take a cruise together, but then he heads for the exit when she suggests they get married at sea. She stops him with a long kiss. It would be unfair to judge the cast and production with forty minutes missing from the 58-minute film, but the story holds up considering. There are times the viewer is confused by what is going on such as why does Vance think the widow is in danger. 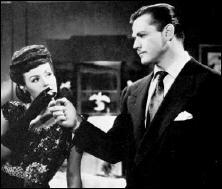 But while the editor of this television version has removed the mystery, the story barely survives to find a home in the crime genre with the relationship between Vance and girl friend Mona providing most of the entertainment. Sources: TCM.com database, IMDb.com, Billboard. If you wish to avoid spoilers you can read Steve’s review of the original film here. I need to find a copy of the original, if only to see Sheila Ryan posing for a pulp cover. I purchased my copy of this movie a couple of years from Movies Unlimited, rather cheaply, but I see they no longer have it listed there. Amazon has a VHS copy, but at $99.99, I don’t imagine you or anyone else would be interested. You’ll have to go to the collector-to-collector market and take your chances as to picture quality, but at a quick glance, I see it’s easily available. When I wrote up my review, I used the IMDB credits, which says it was Frank Jenks who played Vance’s dopey sidekick, not Jenkins. To learn how he’s credited on the movie itself, I’ll have to see how quickly I can find the DVD I have. There may be other versions of the film as edited down for TV. IMDB says it’s 25 minutes long, and even if they’re right and there is one that long, it’s still too short for the mystery to make any sense. But I was there. Back in the 1950s, people would watch anything they could on TV, whether all the middle was scooped out of it or not. I have seen this listed by different collectors, both called it a TV pilot. It would not surprise me to learn this copy was an edited version of the 25 minute version IMDb mentioned. I suspect the short was edited into several versions of various length. Another question is what happened to the other two shorts. “Billboard” (3/21/53) listed the entire library of MPTV (over 400 titles), PHILO VANCE’S GAMBLE and PHILO VANCE’S SECRET MISSION (both with Alan Curtis) were on the list, but William Wright’s PHILO VANCE RETURNS was not. Most likely RETURNS was left off the list by accident (it was a long list), but the three could have been separated. Are there edited copies of the other two PRC PHILO shorts? Probably. TCM (and others) seem very confused when it comes to the order the three were filmed and shown. Was Curtis dumped for Wright? Why the sidekick in two of the three? Why the girl in only one (apparently)? Steve, do you remember why Philo’s secretary was posing for a pulp cover? I got her occupation from the databases, on the show she is called his “girl companion” but nothing else. Thanks, Steve, but the widow of the first victim is introduced as the office secretary in the first scene. Maybe Mona was Jamison’s personal secretary but she sure doesn’t act like it in what I saw. Not in the office scene or the trip to Jamison’s home. She seems more connected to Philo. At the end Philo suggests a cruise to Mona who suggests marriage, not something a woman would do if she had met him two days ago. I hope someone else has a copy of the original short. You need to continue to recover, not attack the home film library. Thanks again for the AFI tip. A better link to the AFI site is this one, http://www.afi.com/members/catalog/, which goes directly to their database. Perhaps you’ve answered your own question, but the other secretary, Mrs. Phillips, is both the secretary of Jamison’s current partner in the pulp publishing company, and the widow of his former partner. I do not believe Philo and Mona knew each other before meeting in the Argo Publications office. When you say “At the end Philo suggests a cruise to Mona who suggests marriage, not something a woman would do if she had met him two days ago.” I can only reply that whirlwind romances such as this were very common in B-movies, whether musicals, westerns or mysteries. There’s nothing like love at first sight! My understanding has always been that a short subject, or ‘short’ for short, is a film running two or three reels or less, say twenty to thirty minutes running time. A 58-minute film (about six reels) qualifies as a feature – a ‘second feature’ or ‘programmer’ to be sure, but a ‘feature’ nonetheless. I’ve seen the term ‘feature’ applied to some films that barely cleared an hour; most of the output of PRC falls into that category, as do films from Monogram and Republic (like Alias The Champ at 61 minutes). I can recall from kidhood seeing some really quick movies on early TV, some squeezed into a commercial-laden hour or even half-hour; this is clearly a subject for extended research by those with far greater resources than you or I. Apologies for being such a stickler about the nomenclature; it’s just that when you say ‘short’ to me, I’m thinking Stan & Ollie or the Rascals or the Stooges or like that there. … and before someone hits me over the head with Hal Roach’s “Streamliners” from the early ’40s (running time approx. 45 mins. ), my understanding of that program was that the films were sold as ‘featurettes’, to be bracketed with a slightly longer feature, this at the outset of the ‘double-feature’, or something like that. #8. My use of the term “short” came from IMDb, but I believe you are correct, Mike. Considering this blog is interested in the history of the genre, and tries hard to be a reliable reference, if we don’t nit-pick and get it right, who will? I have Michael’s permission to revise his review to get it right. As he says, not everybody reads the comments. If I can’t get to it tonight, and I don’t believe I will, I’ll do it tomorrow. Thanks, Mike! Both of the other PRC-Vance movies were just over an hour long. I continued my “research” by checking out the many other B-detective series of the period; most of them came in at 60-70 minutes, mostly in the low 60s. This was a time when 90 minutes was considered a long feature film; if you came close to two hours you were running risks with the digestive tracts of your audience. Truth to tell, I had a whole argument semi-prepared defending my terms, but seeing this morning that it wouldn’t be needed makes me all warm and fuzzy inside. Philo Vance: Detective is stuck on the tail end of another, unrelated DVD collection I have (Thanks to Dennis Thomas). I took a belated look at it last night, and the first thing I saw was the “Official Films Present” opening title. I don’t know this for certain, but I can infer that “Official Films”, at Least back then, was in the business of buying up low-budget film and repackaging it for the newly-expanding local TV marketplace. Part of the repacking would include losing the original studio credits and splicing in their own, totally reshot and in no way resembling the original. Any of you who get to see the original PRC “masterpiece” will no doubt see a completely different (not to mention far more professional) main title. And that main title will give billing to Frank Jenks, one of the most easily recognizable featured players of that era in Hollywood. “Frank Jenkins” is the result of “Official Films”‘s general cheapness and inefficiency; you can find examples of this on other “Official” releases from the same period, whose main titles look exactly like this one (I can’t call examples to mind right now, but I recognized the fonts).